When I was growing up car headlights were pretty boring. They were blocky ovals or rectangles, all made out of the same chunky clear plastic. Now car designers get to play with some of the weirdest headlight shapes since the 1960s, and the new Lexus RC shows that perfectly. I'm not going to say that the RC's headlights are pretty. They're not. I'm not going to say that the RC's headlights are particularly practical. They'll probably get blocked off with snow every winter thanks to that separate, raised LED strip. I'm not going to say that the RC's headlights are all that original. 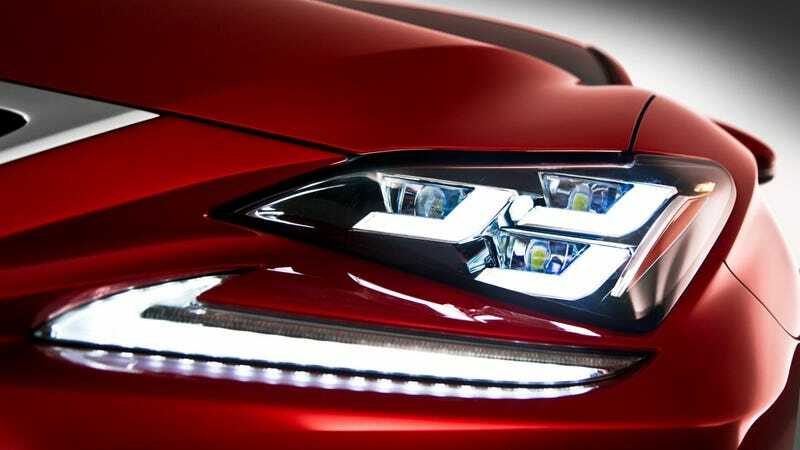 They've got too may similarities to any other recent LED headlight design. But they are bizarre in a way that we haven't seen in a long, long time. The last car I can think of that had headlights as thoroughly bizarre as these was the 1961 to 1963 Imperial. Those top-shelf ChryslerCo luxury cars had fully separate headlight pods, the final work of Detroit's legendary weirdo Virgil Exner (this history right here details Exner's work in relation to the also-strange 1960 Imperial). So I might not like the look of the RC's lights, but I couldn't be happier that car design can finally make the creases, curves and stylistic risks it did back in the golden age the automobile.